Wizardry designs and manufactures microprocessor-based products which either surface-mount technology and/or through-hole technology. This example microprocessor mainboard controls Wizardry's multichannel 200 amp Phase-Controller product. Each isolated power-supply is routed via inner power-planes, to guarantee stable & power-distribution. This is essential to suppress power-supply noise caused by power-switching circuits, or by modern microprocessor chips which draw multi-amp nanosecond-risetime current spikes. 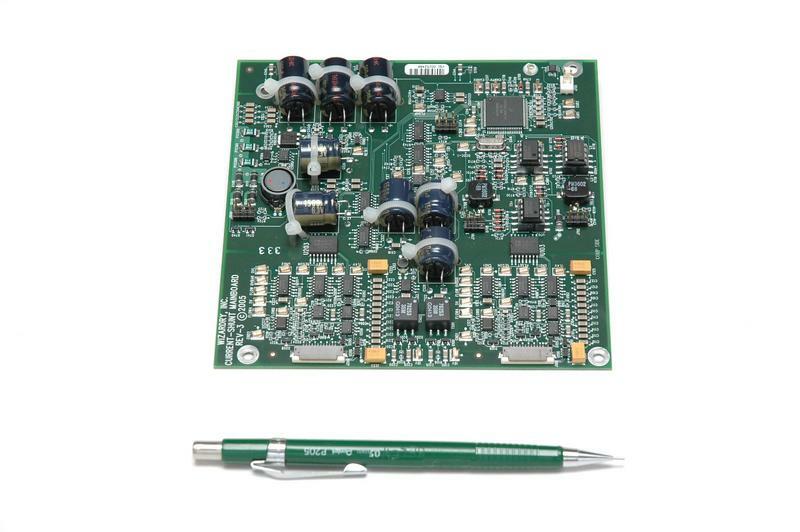 This board contains 2 isolated power-supplies, plus 2 power-supplies which share a common-ground. Stable, noise-free power-supplies are the key to making reliable microprocessor designs. Infinite-life High-capacity ceramic capacitors are used whenever possible. Long-lifetime electrolytic capacitors are chosen, when electrolytics are unavoidable. Extensive use of surface-mount test-points simplifies the test & maintenance process of surface-mount designs. Legends for each test-point improve ease-of-use. Surface-mount sockets for through-hole parts are used, where those parts are more likely to require field- or factory-replacement.